There are commonly overlooked areas of concern when you are setting your tile in the bathroom, especially, but also in the kitchen and other areas. Not all tile setters use the same methods for tile and while some methods are justified, others are only methods that are long on saving on time and effort and short on resulting in a quality that lasts. The following assumes that a durable tile has first been selected for the given application, for example ceramic tile and not clay for indoor areas. The long term integrity of the install will be determined to a large degree by the soundness of the subfloor. A floor built of wood beneath should be solid, and not detectably bouncy. If it unsound, the subfloor may benefit from reinforcing. For cinching framed flooring, methods such as driving added screws, shimming from beneath and/or adding joist bridging could be options. Cracked slabs that are weakened should be repaired by patching or even replacing a section. Floor areas around toilets are notorious for having rough foundation pours and see these areas. If there is vinyl prior to the tiling, be aware that a rigid tile plane will be less forgiving depending on the dimensions of tile being set. Some installers rely on adhesives to form a build-up, but adhesives do have a maximum recommended application thickness. To level the uneveness there are easy pour self-levelers. Often tiles are applied right over plywood, tile, or what you. This is not always recommended however and the entire substrate must be considered at every layer, including from the joists to the plywood to the backer board, if so used. Yet an additional layer may also be added and this is a membrane that basically acts as a moisture barrier, such as chlorinated polyethylene (CPE). Other options include brushed or troweled-on solutions that act toward the same cause. Through all of this, the total new weight load for floor area should be considered as new tile often adds to the structural load. This is less of a concern for walls under most circumstances, although the walls might be either doubled-up with drywall or cementitious backer board installed. Some of the ready-mixed mastics offer quick and easy application from premixed buckets. But which do have performance limitations. As a rule these do not have the bonding ability of thin set, or dry-set mortars. Noting that some mortars have acrylic additives to form stronger bonds. Another alternative is epoxy mortar at the upper end of the price scale. Epoxy adhesive MUST be compatible with the tile and the substrate to which it is being applied and be flexible enough to endure movement. There is often, heard the claim of setting tiles without inserting spacers, and in so doing, still achieving a consistent spacing. In the rare case, this could be true. However frequently it is being done to simply avoid placing each individual spacer along with their later removal. Exceptions to this are either tiles that are (a) round cornered or irregular or (b) tiles that are self-spacing. Meaning that they have lugs integrated into their design that allow for equal spacing, albeit at a predetermined width. At any rate, placing the spacers helps maintain grout line consistency at several widths such as the typical 1/8", 1/4" & 3/16" and 1/2" thicknesses for larger-tiled patterns. 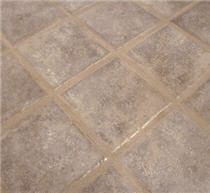 Grout of course imbues color to the overall design but its purpose is also to assist in sealing out moisture elements. Unsanded grout is typically used for thin grout lines such as for 1/6" to 1/8" joints and less, and sanded grout for those that are greater. For areas of increased resistance to staining, epoxy grout is likely an option. Additives are available for enhancing both water and stain protection. Grout must be floated into the joint, to completely fill the channel. Not merely a top skimming to close what is seen. As a rule, the task of sealing the joints with a grout sealer follows at a cure time interval following installation and this does not include any caulking, which is for joints that are subject to expansion and contraction. Maintaining the grout will help preserve its color for over longer periods and most importantly, will help shield away moisture. Sealed grouts that have had some set time should be cleaned before resealing them, partly to remove any existing discoloration. Tile sealers may be either penetrating or coat the surface. They generally serve the same purpose. For future replacements there must be usuable spares that are kept in a dry place. Since matching tiles may no longer be made. A chipped or damaged tile should not have to sacrifice the whole floor. Also keep spare grout mix sealed airtight. And possibly the same sealer, to maintain compatibility. Design a substrate system that best mates on-level with the bordering area(s), with the tile not exceeding this. Account for door cuts to be made.